Should you love perfumes and are on the lookout for a new scent to satisfy your senses, or want to treat your lady to a gift she will adore, check out these two incredible fragrances from Accessorize and Monsoon. We tried the two fragrances, we fell deeply in love and they are now a permanent fixture on the dressing table. Not ready for the summer to end? Let the sunshine linger on with Accessorize’s Lovelily. Launched in November 2016, this beautifully scented fruity and floral perfume is dressed in a design that perfectly reflects the floral elegance of Accessorize’s exquisite fragrance. Lovelily is designed in an eye-catching hexagonal shape, with a stopper containing a gorgeous pink lily. Take one look at the fragrance and you will know you can expect an explosion of happiness and love for the senses. Lovelily offers pure indulgence, featuring top notes of tantalizing raspberry ad raspberry of which work in harmony with bergamot. Contained at the core is Muquet (lily of the valley) that connects with jasmine to uncover a fresh and floral hidden depth, evoking the heart of summer. Furthermore, Accessorize combines aromatic musks with sweet vanilla of which perfectly complement this incredible fragrance. The oh-so-pretty Lovelily perfume is perfect for wearing on a romantic date, or to entice the man of your dreams. Lovelily by Accessorize is the ideal gift for her. The fragrance is also available as a gorgeous body lotion (£19 for 100ml). 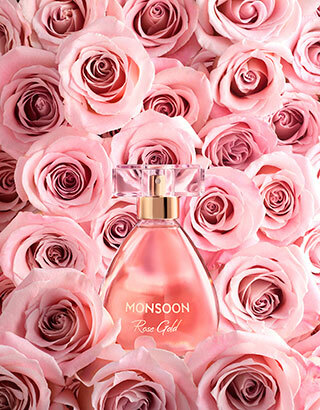 Staying on the theme of irresistible floral scents, we must introduce you to Monsoon’s illuminating Rose Gold perfume. This very feminine fragrance is a celebration of the beautiful rose delicately wrapped with carefully chosen ingredients to evoke heart-warming notes, of which are certain to make you feel as if you are on a yacht, basking in the warm summer sun. Spray the enticing scent and you will be transported into a world of luxurious glamour coupled with a powerful feminine vibe as you breathe in the initial combination of zesty lemon, juicy fruits and ozonic top notes, that demand your complete attention. Perfectly blended within the heart of this fragrance is the intoxicating aroma of soft, luxurious rose, tuberose, neroli and cyclamen. Monsoon’s Rose Gold’s exceptional scent is supported by the carefully selected concoction of base notes that include: balsamic amber, Eastern wood, mosses, musk and vanilla. Should you want to portray femininity, luxury and power, this is the fragrance for you!